This post is in partnership with Versona Accessories. All opinions are my own. My never-ending love story with clothing by Versona Accessories continues with today’s outfit! 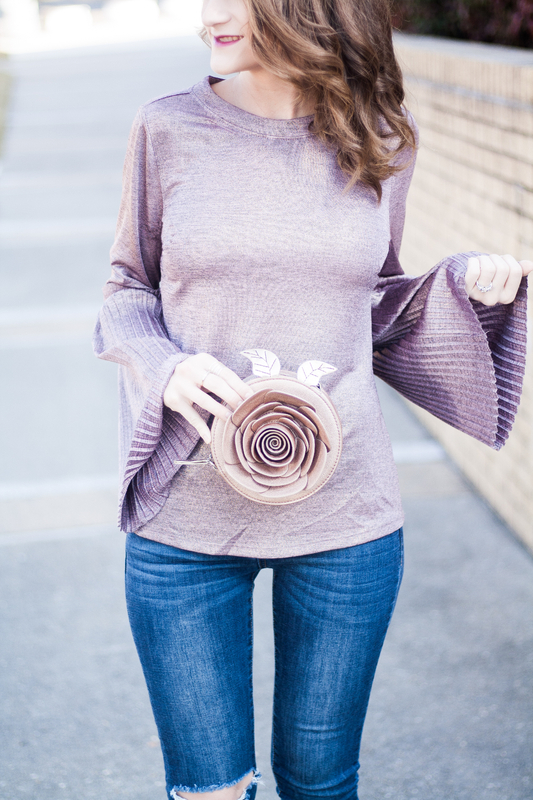 Scroll down to see how I styled this adorable purple top! I picked out this cute light purple top from Versona’s Holiday Lookbook and immediately fell in love. The material is sturdy but light, and the light purple fabric gives off the subtlest shimmer. The accordion bell sleeves add just the right amount of flirtiness to any outfit. A black ribbon ties off a keyhole in the back for a little surprise, too! I wore this top with a simple pair of distressed jeans from Gray Monroe and donned my new Dior plum pumps for a smidgen of dark color down under. Find similar plum pumps here and here. 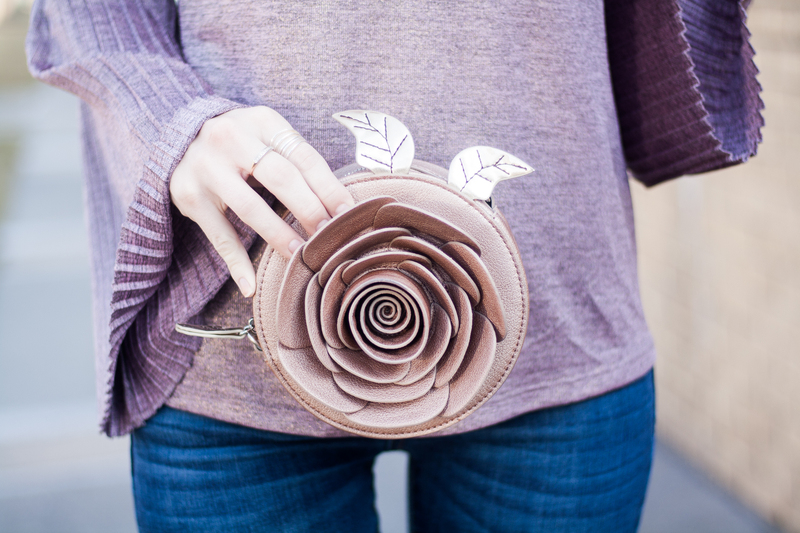 To finish off the outfit, I brought along my favorite clutch: the rose bag from Danielle Nicole’s Beauty and the Beast collaboration with Disney. The dusty pink of the rose-shaped bag complemented the toned-down purple of the top. I had the hardest time finding that bag last year when it was first released, but Disney and Danielle Nicole have it restocked in abundance now! 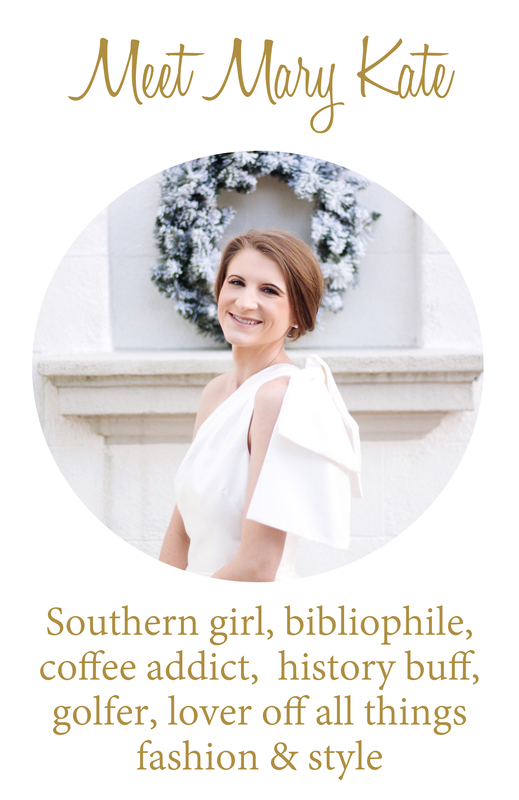 Be sure to check out Danielle’s Disney collection, too! Loving the sleeves on that pullover!! !